Jamal Khashoggi's Last Column Before Disappearance Calls For Free Expression The column's publication is "kind of an acknowledgement to ourselves ... that we don't have much hope that we're going to be able to edit this one with him," the Post editorial page editor told NPR. The Washington Post has published the last column prominent Saudi journalist Jamal Khashoggi wrote before he disappeared earlier this month. The Washington Post has published the last column Saudi journalist Jamal Khashoggi wrote before he disappeared on Oct. 2 after entering the Saudi Arabian Consulate in Istanbul. "We held on to this column he filed the day before he entered the consulate in the hopes that we could edit it with him, as we normally did," Fred Hiatt, who runs the Post's Opinions section, told NPR. "And we waited, and we waited, and I think the fact that we published today is kind of an acknowledgement to ourselves, as well as to the world, that we don't have much hope that we're going to be able to edit this one with him or that we'll ever be getting another column from him," Hiatt said. Khashoggi's disappearance has ignited a diplomatic crisis between the U.S. and Saudi Arabia. On Thursday, when President Trump was asked whether he thought Khashoggi is dead, he said it "certainly looks that way to me." He said the administration was waiting for multiple investigations to conclude and that potential consequences would be "very severe." Khashoggi, a critic of Saudi policy, issued a passionate call for free expression in the Arab world in what may be his final column. He reflected on the hope that many in the region had in 2011, as uprisings swept through the Middle East, in what has widely been called the Arab Spring. 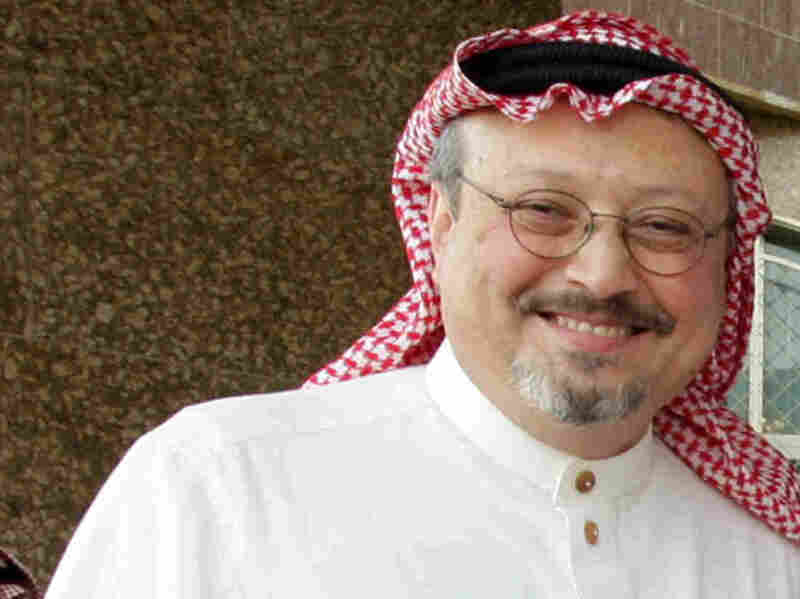 "Journalists, academics and the general population were brimming with expectations of a bright and free Arab society within their respective countries," Khashoggi wrote. "These expectations were quickly shattered; these societies either fell back to the old status quo or faced even harsher conditions than before." Khashoggi spoke about increasing crackdowns on journalists by Arab governments. He called for a "platform for Arab voices." "Through the creation of an independent international forum, isolated from the influence of nationalist governments spreading hate through propaganda, ordinary people in the Arab world would be able to address the structural problems their societies face," he wrote. Karen Attiah, the Post's Global Opinions editor, told NPR that publishing this column now was a way to get "away from sort of the geopolitics and just back to the humanity of it, about his thoughts, his words and his ideas." Khashoggi's column was also published in Arabic, and Hiatt noted that it is currently one of the most read in the Opinion section. "As Jamal said, people want to debate. And one of the most heartbreaking things about this is, he was a patriot. He supported a lot of the reforms that the crown prince of Saudi Arabia says he's for," Hiatt said. "But he believed that the best way to accomplish them was to allow people to debate them and to express opinions and that in the long run, that's the way his country was going to succeed." Hiatt says that he and other Post staff are demanding a "full accounting" of what happened to Khashoggi. "We are all, in the Post newsroom, on the opinion side and the news side, I think everybody is feeling this very personally and I think we're all determined to show that you can't do this to one of ours," said Hiatt. U.S. Secretary of State Mike Pompeo said Wednesday that the U.S. was reserving judgment until investigations are complete, including one by Saudi Arabia. "It's not about benefit of the doubt, it's reasonable to give them a handful of days more to complete it, so they get it right," he said. Hiatt expressed skepticism about the length of time it is taking to determine what took place. "This is a mystery, but one that could be easily solved. Somebody knows what happened, and they should come clean and it doesn't require a lot of investigation," he added. "Once there's a full accounting there has to be real accountability for whoever is responsible for this. And until we have that, you can't have business as usual with the regime." Attiah said she is inspired by Khashoggi's "unwavering commitment to not only, you know, having freedom for himself but trying to extend that to his fellow Arab writers and voices. ... He just wanted the world, the Arab world, to be a better place. And I'll never forget that." Hiatt described Khashoggi as an "extremely warm and generous" man who "helped innumerable journalists who wanted to understand the Mideast. ... If this could happen to Jamal, it can happen to any journalist and that's, to my mind, not the kind of world any of us want to live in."